MDurance is an innovative digital health tool that speeds up the analysis of health and muscle performance. This technology allows to get a report on the muscular state of the patient in less than 5 minutes. Such advance in technology can accelerate the process of diagnosis and recovery of muscle injuries. This highly innovative solution comes from the final project of Ignacio Díaz, a Telecommunications Engineer who wanted to take rehabilitation to the next level. 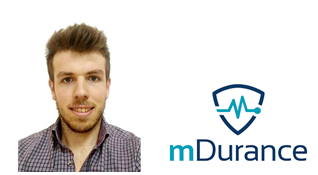 Nacho (Ignacio) is currently MDurance CEO: “I wanted to do something different before finishing my undergraduate degree and I just came across with this opportunity. At University we had one of this sensors and I adapted it to rehab as I have a background in sports”. The company, founded in 2017, had a lot of work ahead to face the challenges of a tough sector: “my profile is technical. I’m an engineer. I knew we had good software. Very visual, quite cool, reduces the time it takes to conduct the test… But it was not validated with customers. Maybe that wasn’t what a physiotherapist was looking for. And by then I did not know that I had to check that, as stupid as it sounds”. Nacho started their experience with eHealth HUB in March 2018 by joining the Lean Startup Academy in Madrid. The aim of the eHealth HUB Lean Startup Academy is to help entrepreneurs to find a sound business model, using the lean startup approach. “I learnt how to test my ideas with real customers. By now, we have validated some of our previous thoughts but we have also made some modifications and targeted our efforts to those customers that we can monetize better. We are mainly working with physiotherapy and sport, although we also reach some hospitals and insurance companies”. With clearer ideas on how to make money, Nacho attended the eHealth Roadshow organised in the Spanish Congress of Physical Medicine and Rehabilitation where he was able to pitch his solution and network with an Expert Committee made up of head of units and physicians of several Spanish hospitals. Some of the results achieved were one hospital live demo, one closed deal and a new potential opportunity discovered. Nacho is very clear on how eHealth Hub has benefited mDurance: “It gives focus”. To the previous, he adds: “it’s a kind of support that makes you focus on your improvement areas and saves considerable amounts of time by telling you which are those areas (sometimes you just don’t know). As they have experience on this, they know which are the common mistakes”.